What Day Of The Week Is September 18? 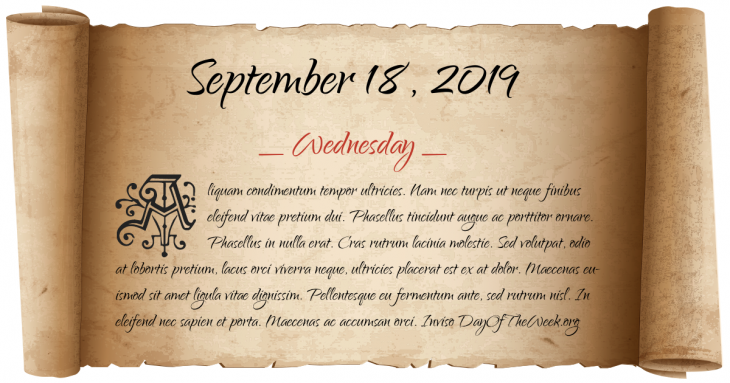 September 18, 2019 is the 261st day of the year 2019 in the Gregorian calendar. There are 104 days remaining until the end of the year. The day of the week is Wednesday. The U.S. Congress passes the Fugitive Slave Law of 1850. King Oscar II accedes to the throne of Sweden-Norway. The Blackpool Illuminations are switched on for the first time. The USSR is admitted to League of Nations. World War II: The British submarine HMS Tradewind torpedoes Junyō Maru, 5,600 killed. The Bahamas, East Germany and West Germany are admitted to the United Nations. Voyager I takes first photograph of the Earth and the Moon together. Soyuz 38 carries 2 cosmonauts (including 1 Cuban) to Salyut 6 space station. Who were born on September 18?